Look up gemütlichkeit in , the free dictionary. Gemütlichkeit (German pronunciation: [ɡəˈmyːtlɪçkaɪt]) means a situation that induces a cheerful mood, peace of mind, with connotation of belonging and social acceptance, coziness and unhurry. Gemütlichkeit derives from gemütlich, the adjective of Gemüt, which means "heart, mind, temper, feeling" expressed by (and cognate with) English mood. This German abstract noun has been adopted into English. The current meaning of the word derives from its use in the Biedermeier period. By the second half of the 19th century, it also became associated with a set of traits supposedly unique to Germans and German culture. In the United States, the city of Jefferson, Wisconsin uses the phrase: "The Gemütlichkeit City" as its motto. The song The Bare Necessities from Disney's The Jungle Book (1967), where a cheerful Baloo explains how "a bear can rest at ease with just the bare necessities of life" was rendered as Probier’s mal mit Gemütlichkeit ("consider trying Gemütlichkeit") in the German version. In the 1973 English contract law case Jarvis v Swans Tours Ltd, a holidaymaker sued after not receiving the Gemütlichkeit promised by the promotional literature for a package holiday to the Swiss Alps. The word can be used in descriptions of holidays. The communal connotations of Gemütlichkeit are also emphasized in some uses of the term. For example, one academic described it as a tradition of "public festivity" (in the form of a "mixture of music, food, and drink"), which "promote[d] community solidarity." The Harlem Renaissance was then cited as of how a sense of Gemütlichkeit arises from a "mix of music, art and politics in service of community consciousness". A less common use of Gemütlichkeit can be found in reference to the economic policy makers and analysts in the United States involved in influencing the decisions of the board of the Federal Reserve System. With respect to the "inflation dampening effects of globalization", a Georgia Southern University professor writes that interpreting certain U.S. economic trends could "spell an end of the Gemütlichkeit — a situation in which cheap labor and money abroad as well as ever-increasing productivity at home had permitted an uninterrupted spell of controlled growth in overall prices". In Dutch, the equivalent is "gezelligheid". The Swedish equivalent is "gemytlig", derived from the German word and with the same meaning. There is also a Danish equivalent (hygge [ˈhyɡə]), which basically means the same. 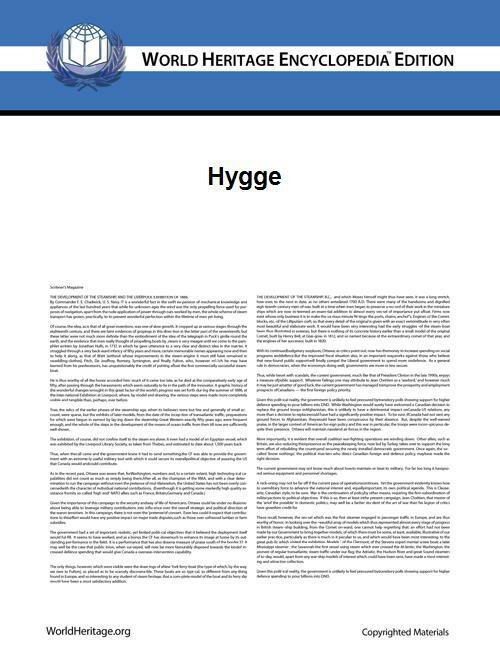 In Norwegian the word translates into "hyggelig". In Russian and Bulgarian, the word commonly translated as cosiness, уют [oˈjut] in Bulgarian and [ʊˈjʉt] in Russian, carries almost identical connotations as the German word.